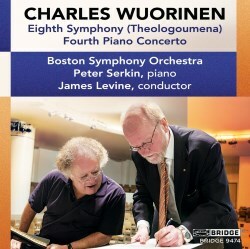 The present disc is a live recording of two recent works by the American composer Charles Wuorinen, both commissioned by the performers of the disc – James Levine and the BSO. Given the relative lack of performances by Wuorinen, both on disc and live (at least in the UK), Wuorinen’s works may be unfamiliar to many (including myself!). There are, however, many positive aspects to discover here, and the recording provides music that is both attractive and skilfully composed. The 3-movements Eight Symphony, Theologoumena takes its title and musical material from a previously published 21-minute orchestral work of the same name. I have yet to come across this single-movement orchestral work, nor have I been able to identify this work online. Yet as is suggested in the liner notes written by Robert Kirzinger, both works can be played together, as a single 4-movements symphony. This is a rather surprising observation, given that the symphony itself feels self-contained. Perhaps one can argue a movement can be placed before the start of the first movement as an introduction, since the symphony presses hard with obstinate rhythmic attacks right from its inception, yet this would be a stretch. Furthermore, when Kirzinger later writes that the 3-movements structure is a “deliberate reference to tradition” by the composer, there is an inevitable feeling that a 4-movement layout would betray the intention of the composer as well as the architectural balance we get in the work as is presented on this disc. Whatever the case this, the symphony is a deeply satisfying one. There are reminiscence of orchestral works by American serialists, such as ones by John Harbison and Elliott Carter. From the onset, the colourful interplay between instruments, confident rhythmic drive, and wide range of dynamics are an absolute joy to the ear. Full of expressive contrasts, the gripping music rarely lets the mind wander elsewhere. Especially attractive, is the second movement, which lasts almost as long as the two outer movements combined. Tension builds up quietly yet with potency, which results in imposing orchestral outbursts. The third movement inherits the quiet sound-world of the second movement, given the dominating presence of pianissimo for most of the movement. The movement leads up to a number of confident tutti, and then ends in a concluding sigh. Although not as tormented, the symphony shares the world of dramatic texture and nervous rhythmic propulsion of the late symphonies of Karl Amadeus Hartmann (e.g. 7th and 8th symphonies), and is also reminiscent of the clear and scintillating orchestration present in Kalervi Aho’s works, such as the percussive 11th symphony. Like many great works of the genre, this symphony by Wuorinen is deeply musical – stark and sincere yet never overpowering in a certain thought, powerful yet also with a unique kind of lyricism. Wuorinen is an established pianist himself, and in the Fourth Piano Concerto, the composer’s thorough understanding of the timbre and resonance of the instrument is on full display. When the piano is unaccompanied, the use of the instrument is evocative, but only slightly, of works by Morton Feldman; one is able to hear the distilled echoes of the notes, from their birth to their decay. Given the presence of the solo instrument – and indeed, the piano narrates the musical argument throughout the whole piece – the orchestration is lithe and humble throughout the first movement, as compared to the symphony. While orchestral outbursts become more prevalent in the second and third movements, this is rarely so overdone as to diminish the significance of the solo instrument. Like the symphony, the concerto concludes quietly after episodes of impactful tutti, with great effect. Overall, the playing is clean and alert, with good tempo judgement – enough for digestion, but enough to avoid congestion. Thus Levine directs a convincing picture of these works that require quick transitions between extroverted thrusts and periods of sensitive quietude. Despite being live recordings, I have failed to detect any noise from the audiences nor have I noticed compromises in the high or low registers. What we then get is a recording that inherits the excitement of a live occasion yet which avoids the potential downfalls which may affect a live recording. All these factors considered, this is a recording I foresee myself returning to regularly in the future.